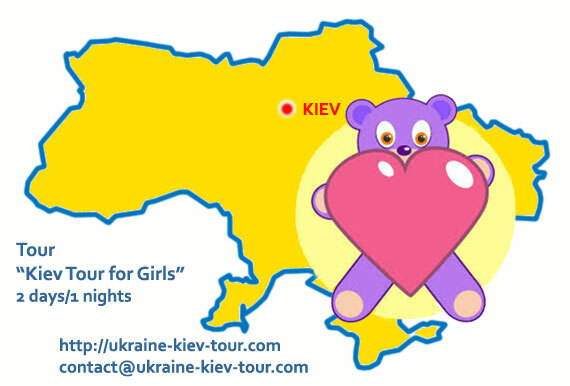 Kiev tour for children is special tour for parent with girls who want to see most interesting sights and attractions for girls in Kiev. It includes visit of Children Landscape Park, Museum of Popular Science and Technology Experimentanium, Kyiv Academic Puppet Theater, Museum of Antique Dolls, Children City Kidswill, Raccoon Сountry, Zoo 12 Months, Aquapark "Terminal", State Museum of Toys, Kiev Oceanarium "Sea Tale" and children cafes for nice and healthy meals. Enjoy your time with your children in Kiev! Meeting at hotel in Kiev. Transfer to Peizazhna Alley for visit of unique Children Landscape Park with funny cats, statues, fountains and benches.Then drive to Museum of Popular Science and Technology Experimentanium to look exposition that includes about 250 interactive exhibits and covers the main sections of physics studied in school: Mechanics, Electromagnetism, Optics, Acoustics. Next transfer to Cafe Baby Bar for tasty lunch. 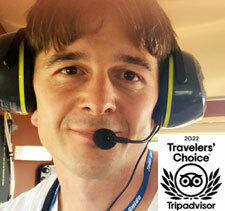 After good meal take tour of Kyiv Academic Puppet Theater and Museum of Antique Dolls. Transfer to ArtMall for visit of Children City Kidswill where girls can try themself in more than 100 professions and Raccoon Сountry - petting zoo where presents more than twenty species of birds and animals: raccoons, nosuh, ponies, sheep, goats, rabbits, guinea pigs, kangaroos and other animals. Evening transfer to Cafe Garden for natural, organic and tasty dinner. After amazing day transfer to hotel. Morning meeting at Kiev hotel. Transfer to Zoo 12 Months - happy animal park located on area of 16 hectares with possibility to look at more than 100 exotic animals and birds. Also girls can feed and touch animals like ducks, chicken, rabbits, geese, dwarf sheep, cow, pig in Petting Zoo. Good lunch in Restaurant "Ludwig King" in replica of Neuschwanstein Castle. Next drive to Brovary to visit Aquapark Terminal where children can ride on the water slides and a swim in the water. After the aquapark drive to State Museum of Toys where there is a collection of 15 000 toys which illustrates the history of Ukrainian toy production - pearls of the museum exhibition are doll and African-bobblehead of XIX century of family of Academician Alexander Bogomolets. Next transfer to Kiev Oceanarium "Sea Tale" where girls can look at variety of exotic fish, sharks, crocodiles, sea rays, moray eels, turtles as well as go through underwater glass tunnel located at a depth of 2 meters under water. Next transfer to Mumi Cafe - special cafe for children where girls have delicious dinner. 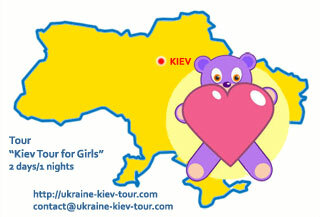 After full day of sights and activities transfer to hotel in Kiev - two days of amazing Kiev trip are finished!